National Biodiversity Program is an umbrella program covering environmental protection, biodiversity conservation and sustainable management of natural resources. Mongolian territory spans across the Siberian taiga to the Central Asian dry steppes and the deserts. Due to the transitional ecosystems and harsh continental climatic conditions, the biodiversity in Mongolia is unique and delicate. Pastoral livestock husbandry is well adapted to seasonal climatic and geographical conditions, and is an important part of the biodiversity. The pristine natural and semi-natural ecosystems are dominant in Mongolia (98.4% of the total territory), and the species composition is still in healthy condition, which provides the opportunity to reduce potential expenditures on biodiversity conservation. However, reflecting on the economic sectoral impacts on biodiversity, a very little effort has been made to sustainable management of natural resources by the main economic sectors reliant on natural resources (livestock husbandry) and sectors based on natural resources (minerals resources). Hence, the future biodiversity loss and degradation may get worse, which in turn increases conservation expenditures rather than curtailing them. 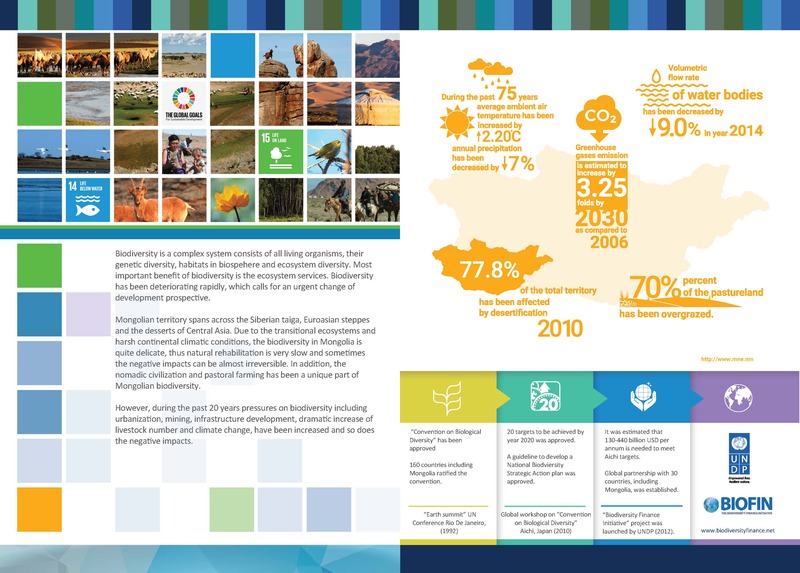 In Mongolia, BIOFIN was officially initiated in September 2015 by UNDP with an endorsement by the Ministry of Environment, Green Development and Tourism (presently Ministry of Environment and Tourism). BIOFIN research and analyses are conducted within the framework of the National Biodiversity Program (NBP) 2015 – 2025. NBP was developed in the context of Aichi targets, Sustainable development vision and the Green development policy, and was approved by the Government Decree #325 in August 2015. By improving the enforcement of the Law on Natural Resource Use Fee, and realigning the revenue, it is feasible to increase the funds for environmental protection approximately MNT 15 – 16 billion per annum. Reintroduction of pasture fee could mobilize at least MNT 5.6 billion in the local budget fund. If 30% of the revenue is used for pasture management as per the Law on Natural Resource Use Fee, a minimum of MNT 1.7 billion would be available annually. Mongolian National Chamber of Commerce and Industry estimates that a total of MNT 93 billion was spent on CSR by 15 private companies in 2015. Although, it was not spent on biodiversity related initiatives, the figure proves that the private sector in Mongolia has the potential to participate as a key partner in establishing the Environmental Trust Fund. The main purpose of this finance solution is to mobilize resources for a viable business based on the sustainable use of natural resources. For instance, Khustai Nuruu National Park was established to reintroduce the Przewalski’s Horse. By implementing this project, tourism infrastructure was built and currently the environmental protection and biodiversity conservation initiatives are financed by the revenue from the tourism activities. Private sector involvement based on the right balance of profitability and social responsibility. National BIOFIN team provided technical support for developing the action plan of the National Biodiversity Program (NBP). Using the activity based costing Finance Needs Assessment was conducted, which is also under peer-review by the global team as well as by an independent third party. It was estimated that a total of USD 123.9 million is required for the implementation of the NBP in 2017 – 2021. Projection shows that 32.6% and 31% of the total finance needs can be provided by the national budget and projects funded by various donors, respectively. Therefore, the total finance gap is USD 45.2 million or 36.4% of the total finance needs. 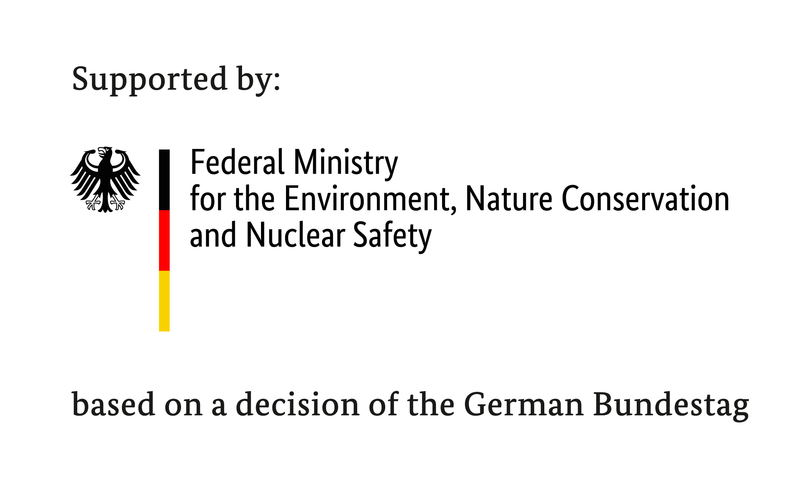 Biodiversity Finance Plan or the synthesis report is still under development. BFP describes the strategy to mobilize internal as well as external resources to fill the biodiversity finance gap. All existing and potential financial solutions were assessed based on their implementation feasibility. Based on the results of the assessment, a total of 10 financial solutions are included in the BFP. Following four of the financial solutions are prioritized for implementation: 1) Realignment of taxes on natural resources use; 2) Reintroduction of pasture fee; 3) Environmental Trust Fund based on private sector; and 4) Impact investment. It is necessary to conduct the detailed feasibility study of the financial solutions prior to implementation. Feasibility study of the first three financial solutions are planned in 2017. As for the impact investment, a detailed business and investment plan is fundamental. Consultancy services to develop the detailed plan has been advertised.